Catalina Talero is a career educator and Fulbright Scholar residing in Washington, D.C. PoP-Ed. posts may be submitted via email to princeofpetworth(at)gmail please include PoP-Ed. in the subject line. If you passed through Connecticut Avenue, particularly around K St., at any time during the day or night of June 28th it is likely that you were overcome by waves or, at times, a small sea of yellow . Colombia will play Brazil over the July 4th weekend and when that happens that #seaofyellowjersies promises to swell into a giant, golden ocean of fans rooting for Colombia. Last Sunday (the day after Colombia vs. Uruguay: 2-0), a highly regarded friend energetically expressed her happiness that Colombia seemed to have left its World Cup brutality in the past. She brought up the fact that Colombia used to assassinate its own team members if they missed crucial goals, especially penalty shots, giving new meaning to the term “sudden death overtime”. The authenticity of her congratulation was clarion. What could I say? She was right. And it could also be said of Colombia’s 2014 World Cup run that, regardless of outcome, thus far it is ineffably swathed in beauty. One might even venture to suggest that this is so precisely because our collective past is marked by national tragedy. Some of the most creative human rights abuses in recorded history have indeed taken place on Colombian soil. 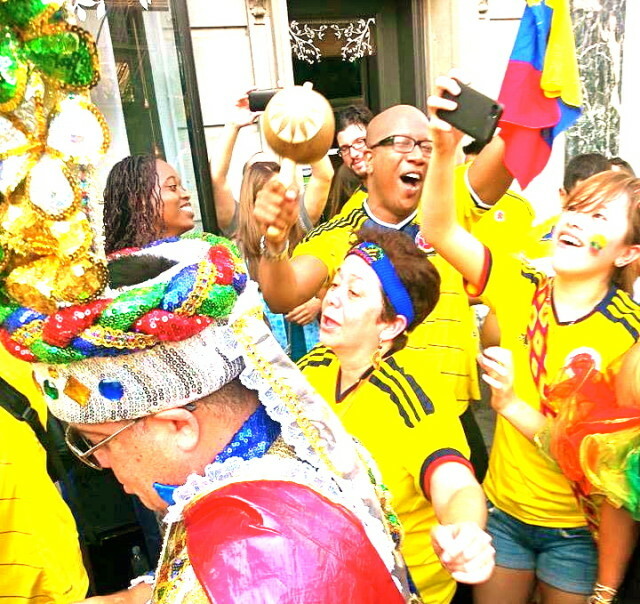 Colombian-Americans, however, are ambassadors of so very much more than war and its spoils. Our ability, education, resilience and Nobel-prize winning contributions to literature far exceed even the fecundity of our exquisite biological diversity, our sublime flora and fauna. Copa do Mondo Brasil marks our first participation in the event with formal peace negotiations underway in Colombia. Irrespective of how an individual Colombian-American may identify politically we are focused –as a group- on peace, prosperity and sustainability. Ask any DC Colombiano: he or she will gladly testify. One of our favorite chants as soccer fans is ¡Amen!